What Do You Do With a Big Blue Two? 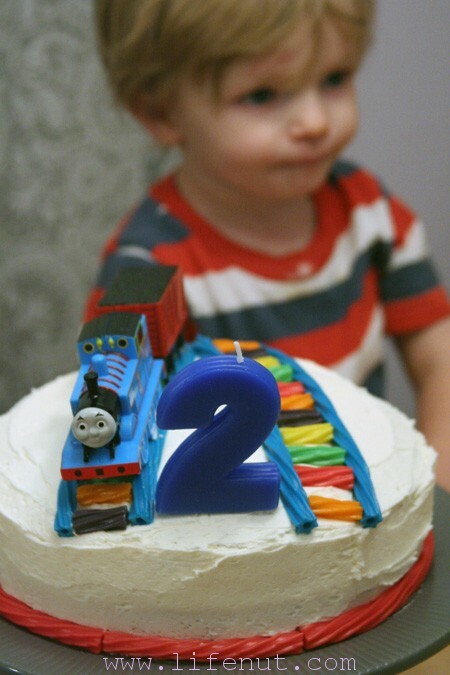 Ollie’s second birthday theme was Thomas the Tank Engine, who is a cheery shade of bright blue. The cake was blue velvet and the plates were blue. When I looked at the birthday candle selection, a blue “2” caught my eye. I didn’t think about the size in relation to the cake until it was party time. I took it out of the little box and laughed. It was gigantic. After blowing out his candle like a very big boy, I removed it and the rest of the cake toppers. I put it by the sink and had a brief flashback to another “2” candle. That candle was a symbol of loss and sorrow. The new big blue two was simply a marker on a happy road, proof of life’s little surprises. Later, while cleaning up, I wondered what to do with the big blue two. It was still in good shape because it had only been lit for the span of Happy Birthday. It’s not warped or misshapen in any way, so it seemed like a waste to throw it out. I put it in the kitchen odds and ends drawer to live with plastic cutlery, twist ties, rubber bands, and sneaky crumbs. Will the “2” ever find itself wearing a flaming cap again? Probably not. Ollie is our last baby. I feel a bit sorry for it in the same way I once felt achingly sorry for the Lowercase N, standing on a hill. The wind was very still. It was lonely and cold and it was known the Lowercase N would cry out now and then. I hope the big blue candle doesn’t share this fate because the remedy is a rocket ship to deposit another “2” at our house. I don’t need that landscaping headache or media circus. Plus, we are about five years away from a 22nd birthday. I will lose patience with the junk drawer way before then. Silliness aside, I’m humbled we’ve had four more second birthdays since that painful day in the kitchen nine years ago. The simple chunk of shaped wax gutted me, which seems bizarre and overwrought years later—almost embarrassing. But sorrow and repeated kicks in the gut can transform the most mundane objects or events into arrows. I’ll never forget how it felt to be reminded of loss when I least expected it. I’ll never forget about the foolishness of making assumptions. Eleven months later, Beatrix was born. I don’t know what happened to Joel’s second birthday candle. Did I toss it out in a fit of junk drawer purging? Did some small child sneak off with it? Did aliens abduct it to take it to a lonely “2” on a far off planet? 1 comment to What Do You Do With a Big Blue Two? I have been recently reminded that expectations can quickly be upended. And then you find yourself hunting for the 2 candle again. And hoping.